The Apple iPad is the undisputed king of tablet computing. With more than 100 million units sold to date, iPads represent 95% of all enterprise tablet activations and 94% of Fortune 500 companies are either testing or deploying iPads. Portability of iPad is key: Reps can easily carry an iPad around, it’s not as heavy and cumbersome as a laptop -- they don’t have to boot up! iPads can connect to the Internet on the fly: Reps can instantly access the Internet, so they can augment their presentation with real-time information with a tap of the screen. 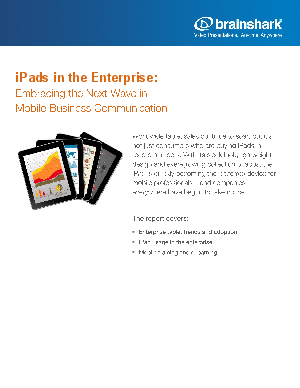 iPads integrate seamlessly with the Cloud: Reps are constantly on the move, and need to grab information on the go. Pulling content down from the cloud in between appointments is their way of life – whether they are accessing the most recently updated presentations or getting smart with a training video.